Harry Bisseker was born in Handsworth, Birmingham in 1878, entered the Wesleyan ministry in 1901 after graduating from Jesus College, Cambridge and was appointed Chaplain at The Leys School in Cambridge from 1901-4. He was then Minister of the Leysian Mission*, London until 1910. He married his wife Doris Holman in 1908, whose family were connected with The Leys and the Leysian Mission. 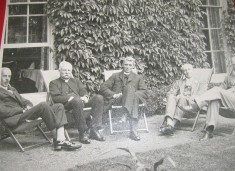 Harry was Tutor at Richmond College 1910-1919 in New Testament Language and Literature and Philosophy, then was headhunted and became the third Headmaster of The Leys School in 1919 until 1934, when he retired for medical reasons. Bisseker House at the Leys was named after Harry and a portrait of him hangs in the Dining Hall. Problems of Discipleship Late 1800s. *The Leysian Mission (in London) was founded in 1886 as a large Wesleyan Methodist settlement and mission by past and present scholars of the Leys School, Cambridge. 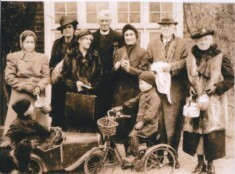 The object of the mission was two-fold: “to bring religious and ameliorative influences to bear upon the lives of toilers in one of the most crowded districts in London” and “to give to those who have enjoyed the privilege of a public school education the opportunity of coming into direct and sympathetic contact with the social problems that appeal for their solution to the Christian Church and to all good citizens at large”. The Leysian Mission closed in 1989 and the congregation united with Wesley’s Chapel, City Road, London, to form Wesley’s Chapel and Leysian Centre. After Harry retired he bought the Old House, no. 25 in the High St, Harston. There he had a study with every inch of wall space filled with books. There he meticulously wrote his own books and sermons, and relaxed by playing patience and reading every book that Agatha Christie ever wrote. Harry used to have his regular daily constitutional walks twice a day, smartly dressed and taking his walking stick that never touched the ground. 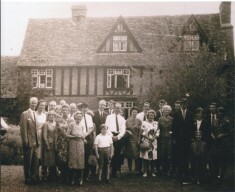 While Harry was Head at the Leys, his wife Doris did her best to make the new boarders welcome by inviting them individually to tea in the Headmaster’s House. In Harston, Doris was very sociable and loved to have family visitors. She had lots of individual trays with teapots etc. and visitors who stayed at The Old House would get tea in bed first thing in the morning. People used to bring jars of home made jam, home made cakes, etc. to help Doris when she had visitors. When there were large family gatherings at The Old House the grandchildren had tremendous fun playing in the house and in the garden around house. Doris would cycle round Harston visiting those who the Vicar said would benefit from a visit, whether lonely or needing reading to as they were blind. However, she had to be back for meals with Harry, who liked them to be at the same times every day. She used to give simple jobs to people who were out of work or down on their luck, and have them in her kitchen for a meal. Doris also set up the Over 60s Club in the Village Hall (opposite The Old House) where local elderly men played games like dominoes, and she arranged for visiting speakers to come in. 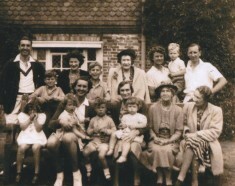 Harry and Doris had three children, Marian Ray (known as Ray), John Brian Holman and Edith Mary, known as Bunty (as she was considered agreat organiser, as Bunty was in a book called Bunty pulls the strings). Until she moved away Bunty was the leader of the Harston Girl Guides. As their son, John Brian Holman Bisseker (known as Brian) – a Captain in the Royal Marines – was away during WW2, his wife Josephine (known as Cherry) lived temporarily at The Old House with his parents. Their daughter Frances Diane was born there in December 1944 in the ‘Green Room’. She had an elder sister, Doreen (known as Dee) and cousins Mike, Nigel and David, sons of Ray. The boys all went to The Leys where Sundays often meant a cycle ride to Harston for tea at the Old House with their grandparents- Harry and Doris.